Getting old stinks, but I’m not talking about me. 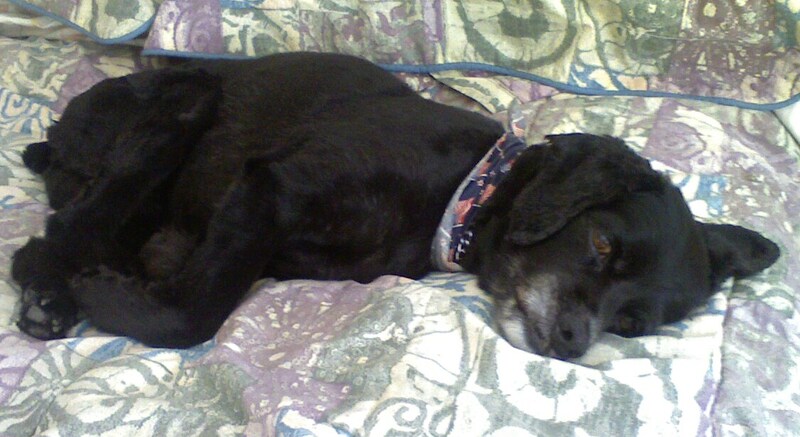 Rascal, our cocker terrier mix will reach 15 years this October—about 103 in dog years. He used to run up to seven miles with me and be ready to keep going. Several years ago his vet put an end to that. Too hard on the old joints. I remember the first night that we got him as a six month old puppy. I set up a nice little wicker doggie basket complete with a blanket next to our bed. He looked up at me with those soft brown eyes as if to say, “Who are you kidding. We both know I’m sleeping on the bed with the two of you.” Then he leapt up from the floor onto the bed. 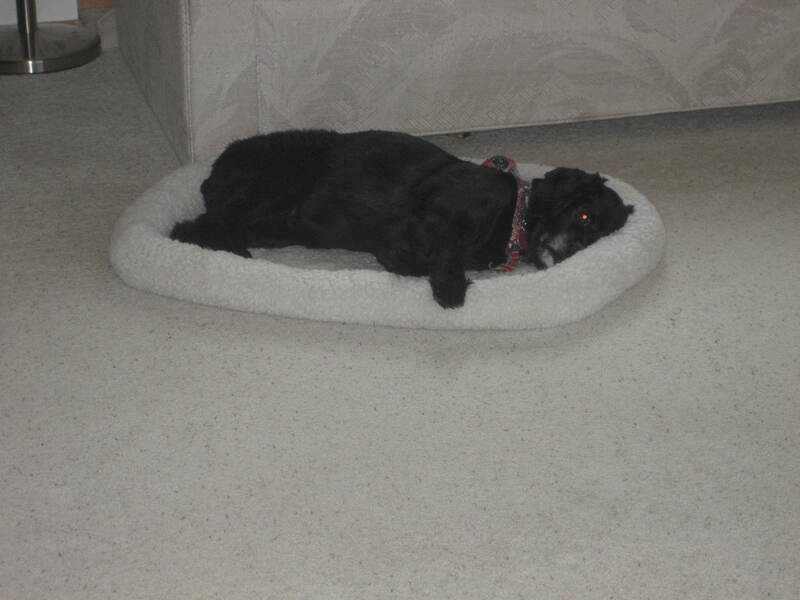 He’s slept on the bed when he wants for the last 14 years. Only now to get up on the bed he has to use a special set of stairs. Most of the time now though he sleeps on the floor to keep cool. His overactive thyroid (that requires twice daily medication) keeps him hot. Two weeks ago we bought a window air conditioner for our bedroom to help him keep cool. He better never complain about the service here. He also struggles to navigate stairs. Last spring his back legs gave out while he was climbing up to the second floor alongside Ralph, a house guest and Air Force buddy from Germany. Ralph had to reach out and grab him before he slid down the entire flight. Then last month when we were visiting friends at their lake cabin he started down a steep set of stairs into the basement. The front legs gave out and he tumbled straight down. I was afraid I’d seen the last of him but he popped right up as if to say, “I meant to do that.” I hope I can do that if I ever reach 103. I expect at that age I’d be tangled up in my walker at that point. 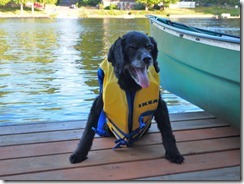 When we went canoeing at the lake cabin I wanted to take him along for the ride. Laurie insisted that the two of us wear our life vests so that we’d be able to save him in case we tipped over. I figured in that case he should be wearing a vest as well. Good thing our friends, kids had their vests from when they were much younger. As you can see in the accompanying picture, he’s grown indulgent with my request for photo ops. As he’s grown older he also sleeps more soundly. When the dog sitter or other people stop by during the day they often go stand over him for a few moments to see if he’s still breathing. He usually wakes up with an embarrassed look that he’s failed miserably in his guard dog duties. Laurie has been on a sabbatical for the last four months so she’s spent a lot of time with him during the day, prime puppy dog nap time. She said that during the day sometimes her only indication that he’s still with us is that he’s passing gas. I guess there’s another part of getting old that stinks—literally. Hey Dennis, this blog about your dog really struck a cord with me. One and half years ago we had to put down our Belle, the sweetest bordie collie ever. She too, started “crashing” while climbing or descending our stairs. Sad. 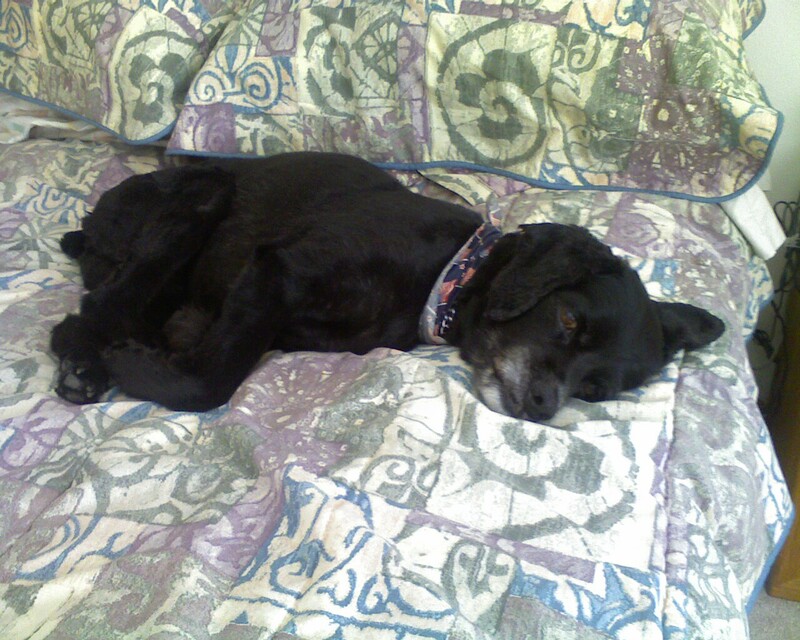 Our family still grieves over this member of our family. Makes one believe that dogs do go to heaven!